A highly portable, quiet-running air compressor that keeps the user focused on the task at hand by being maintenance free and requiring no oil to keep going until the job is done. Powerful equipment can come in small, portable packages. 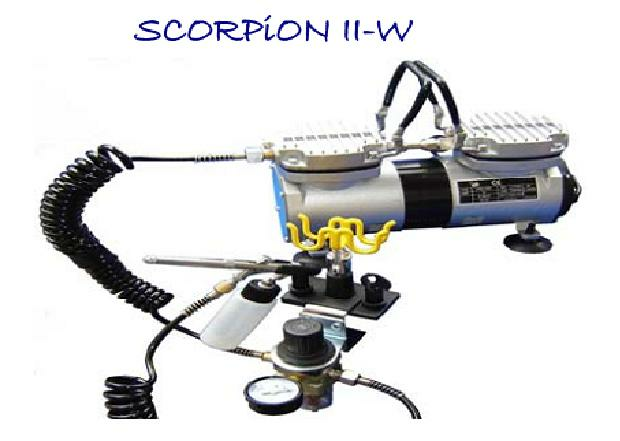 The Silentaire Scorpion II compressor embodies these characteristics perfectly, with a great deal of power packed into a unit that can easily be taken almost anywhere. Silentaire is known for its dependable Italian-designed compression products and the Scorpion II is no exception. The 1/3 HP motor keeps enough power in hand to take on the tasks at hand, while the automatic operation and ultra quiet running keep disruption to a minimum. The unit reaches only 55 decibels in terms of noise, keeping things comfortable for anyone within audible range of the device. For the user there's a line pressure gauge and in-line regulator with moisture trap to keep the operation safe and under close control.